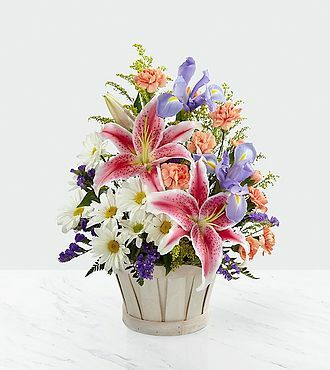 The Wondrous Nature Bouquet by FTD is bountifully bedecked with a dazzling display of color and beauty. Stargazer lilies stretch their fuchsia petals out amongst an arrangement of blue iris, white traditional daisies, orange mini carnations, purple statice and yellow solidago in a round whitewash handled basket, creating a delightful bouquet your special recipient will adore.Lilies may arrive in various stages of development. The lily blooms will continue to open, extending arrangement life - and your recipients enjoyment.